Moot Court gives Wabash students the opportunity to practice real-world oral advocacy whether they plan on pursuing a career in law or not. A perfect example is 2010 Moot Court winner Donovan Bisbee ‘12, who plans to go into teaching. 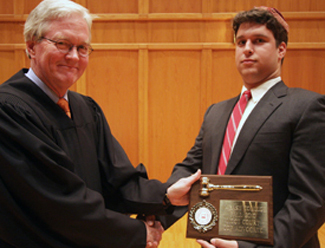 Moot Court began at Wabash in 1995 and remains one of the few undergraduate Moot Court competitions in the country. This year's event started with 24 Wabash men and was paired down to Kyle Bender ’12, Riley Floyd ’13, Steve Maynard ’11, and Bisbee. See photo album from 2010 Moot Court here. You can watch the entire Moot Court competition on Wabash's YouTube page. The students argue their case in front of three real judges and a Wabash College professor. The judging panel was led by John Tinder, U.S. Circuit Court of Appeals 7th District, Paul D. Mathias, Indiana Court of Appeals, and Tim Oakes ’86, Marion Superior Court. The Wabash judge was Dean David Timmerman of Monmouth College. Timmerman ended 16 years as a Wabash Rhetoric professor over the summer to become Dean of Faculty at the Illinois College. He also was one of the guiding forces in growing Wabash's Moot Court. Wabash alumni play an active role in shaping the case, advising the students, and judging the preliminary rounds. This year’s case tested a state statute limiting the ability of a business to sell or rent violent video games. The judges’ panel was aggressive from the start, peppering each of the respondents with a question before they even got to their prepared remarks. Bisbee, a rhetoric and English major, plans to go to graduate school and then pursue teaching. Afterwards, the three sitting judges praised the students for their preparation. But Oakes got the biggest ovation when he talked about his pride and the joy of seeing the students early in their careers. He expressed his confidence the students would grow into self-confident, and perhaps even difficult or irascible attorneys. But he expressed that sentiment in more common terms any Wabash man would clearly understand. In photos: Judge Tinder presents Donovan Bisbee the Top Advocate Award. 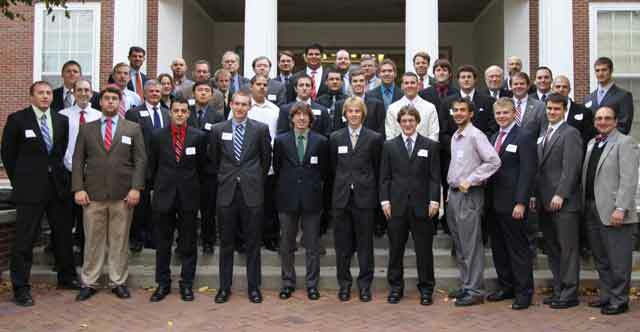 Below, is all of the students, alumni and faculty participating in the 2010 Moot Court Competition.